If you LOVE Mexican food like I do, you’ll love this recipe. This is the easiest soup recipe I have EVER made and it is so delicious! Takes under 15 minutes and the flavor is FANTASTIC! I got the recipe from my friend Gina and modified it. 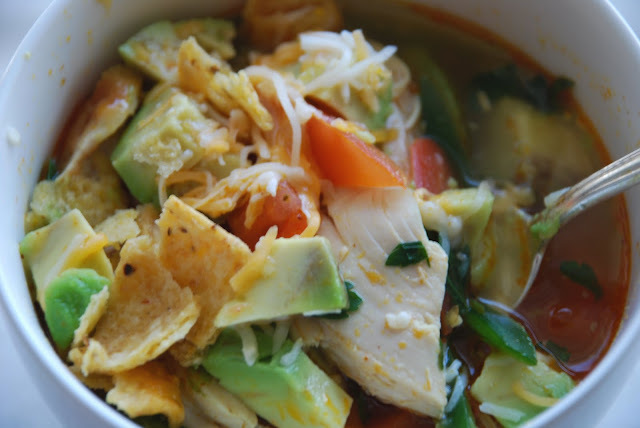 I used both the light and dark meat from the rotisserie chicken (1/2 cup per cup of broth) because that’s the way I always had it in Mexico along with fresh tomatoes and jalapeno chilies, fresh corn, cheddar and colby jack cheese and a little more avocado. Honestly, this soup reminded me of the one that I use to get fresh from my favorite little woman in the Tonola market on Saturday morning. P.S. Mark this as one of my all time favorite easy recipes.